Have you heard about RADD? RADD refers to a purely made-up syndrome called Reader Attention Deficit Disorder, and almost every adult I know suffers from it. RADD is a result, I believe, of the excessive time we spend reading on screens and devices. Even though RADD is a made-up syndrome, the struggle to read better online is real. As content creators, we can help make online reading easier. And one of the most powerful tools of our trade is the humble subhead. In the grand scheme of your piece of content, a single subhead might not seem very important. After all, it represents a tiny percentage of your overall word count. But I like to think of subheads as signposts. When you’re on a long road trip, it’s comforting to see signs along the way that confirm you’re driving in the right direction. Subheads do this for your reader. They draw them down the page and through your content, letting them know they’re moving toward a conclusion. If you’re not currently using subheads in your online content, it’s time to start adding these signposts that will help make your content easier to read. There’s more — subheads actually have three jobs to do at the same time. Read on to learn how to make them work for you. Readers suffering from RADD appreciate well-crafted subheads because they help them decide whether they should commit their precious attention to reading your information. To get distracted online skimmers to engage, write subheads that shamelessly promote your piece of content. For example, let’s say you’re writing an article about how to design a perennial garden. In the examples above, the second subheads promote the content better because they explain how the reader will benefit from consuming it. If the distracted skimmer is about to start a perennial garden and she’s looking for help, these subheads will convince her that this content will deliver the information she needs right now. Congratulations: you’ve hooked a reader on your piece of content. 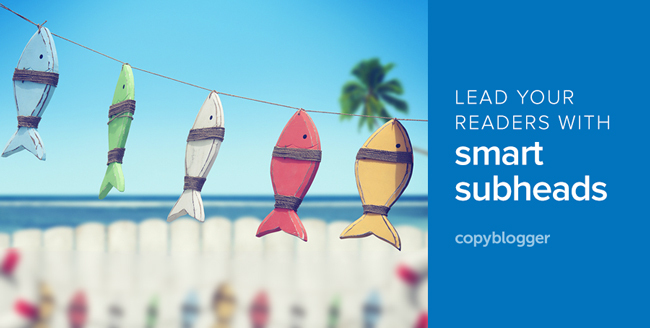 Now use compelling subheads to “re-hook” them all the way down the page they’re reading. It’s no wonder readers feel distracted while reading online. Between links that invite them to click away and read something else, to ads, notifications, and invitations to check out another part of a website, readers have to force themselves to stay on track all the way down the page and through your content. If you write them carefully, your subheads will “sell” the section they’re sitting above. They serve as “ads” for each section that convince the reader to consume it. Highlight the benefit of the knowledge offered in each section. Use your best headline writing skills to craft compelling subheads that inform and intrigue. Focus your reader’s attention on how she’ll use the information that follows. There’s one more thing to remember about subheads — an extra layer of information to consider. Read on to discover how to write subheads that become their own standalone content. Let’s face the ugly truth: sometimes trying to get RADD-afflicted readers to consume your entire piece of content is a losing battle. Some readers simply won’t read all the way through your content, despite all your best efforts to make it easy to read and to write subheads that pull them down the page. But all is not lost. Even non-readers are valuable. You see, even non-readers share your content. And compelling subheads that tell a story all by themselves will help convince those non-readers to spread your content to others who will read it and act on it. The key here is to have established natural authority with your content. If these non-readers trust your site and perceive it as a reliable resource, they will share your content without even consuming it themselves. If I only read the subheads, would I think this content is valuable? If you can’t answer “yes” to that question, edit your subheads until you can. If you’re interested in improving your subhead-writing skills, you’re in the right place. We have a wealth of information here on Copyblogger that will help you polish your subheads until they hook those distracted readers and encourage them to read, consume, and share your content. Sonia Simone’s The Deceptively Simple Steps to Persuasive Writing That Works is an ode to the humble subhead and a great read to inspire you to use this powerful tool to make your content easier to write and read. For more about how you can adapt your writing style to fit the new reality of online reading, take a look at my post 6 Easy Ways to Adapt Your Writing Style to the New World of Content Consumption. Stefanie Flaxman’s post How to Spot the Weakest Part of Your Blog Post (and What to Do About It) will give you an overview of how subheads fit into your larger content plan. It shares concrete tips for making your article look and sound more compelling. What’s your favorite subhead advice? What’s the best advice you’ve heard about writing compelling subheads? Enrich the information on this page by sharing your best subhead-writing techniques below. This is a great insight, i did not know subheads can have a big impact on our content. I’ll implement it and see how it goes. You’re welcome, Bill. Thanks for stopping by. Love it – RADD! It’s so true! Thanks for the reminder and the subhead examples! Great stuff Pamela! I love your Reader Attention Deficit Disorder mantra. So true. It’s so difficult for writers and bloggers to hold someone’s attention all the way to completion. Riveting subheads are just as vital and titles and headlines. I shall go straight to my latest posts and improve the subheads. Hadn’t realised the strong impact and role they have. Thanks for this, Pamela! Screens are distracting places! Anything we can do to encourage the reader get through our information will help it get consumed (and acted on). Thank you Pamela! Great content and probably one of the most valuable posts I have read by far. And I had no idea I suffered from RADD lol. I never knew subheads could have such an impact, I am very excited to start using this technique. Thanks, Sue-Ann. And what a badge of honor to have Ann drop in and like a subhead! Very cool. Thanks for this article on subheads. Absolutely, subheads are important in content like blog posts. But, I find, they’re even more important in conversion-oriented marketing copy. If the buyer is simply skimming the home page or product page, then putting the main product benefits in the subheads can draw them in to read further. Or they can walk away, but at least they’ll walk away with those benefits stuck in their heads. Great point, Tom. Subheads on sales page (or in sales emails) are super important. They don’t just keep attention, they change minds! For me, I have grown from a college amateur writer to somewhat-okay writer. I am here for two reasons – Improve my writing. I love Copyblogger a whole company. Sub-head’s. As of now, mine are vague, non-hook type and boring. I occasionally try something different though. Notes taken. No advice from me. I am glad to shower in the depth of writing and apply it to my own writing. Thanks for this great advice. I’m trying to increase readership and I can be a little long-winded, so subheads might be just the thing. Ready to give it a try! This is just the great stuff I’ve been racking my brain over, how to be less boring. I mean how to make the content more interesting for the average reader. My site and blog is not about selling anything but doing audio book reviews. I want to make it easier to read, more eye appealing and make readers return. Thanks for the excellent suggestion. You do rock. Great advice Pamela. I’d say the best advice I’ve heard about sub-heads is to start them with a verb. Great help. Thank you. Sharing with my writers guild immediately. As a sufferer of RADD I can completely relate to this post. In fact, I scroll independently of reading and if I cant catch up I tend to abandon a post. I find the headings extremely helpful. Only new to blogging and trying to keep my posts readable. Thanks for the tips. i have been trying to get a tutorial/article like that fully talk about sub head, this a very good and great article, i must confess, going to share with my people on social media and thanks alot.